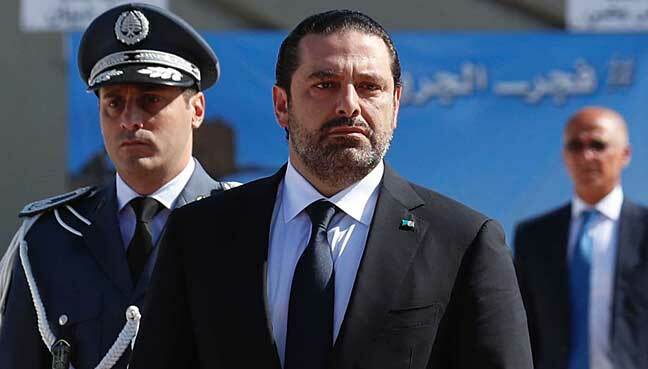 BEIRUT: Lebanon’s president will not accept the resignation of Prime Minister Saad al-Hariri until he returns to Lebanon, palace sources said on Sunday, delaying for now politically difficult consultations on his successor. Hariri left Lebanon for Saudi Arabia on Friday and resigned on Saturday in a televised statement that took the Lebanese political establishment by surprise. He cited an assassination plot against him and criticised the regional role of Iran and its Lebanese ally Hezbollah, however, Lebanon’s army said on Sunday it had not uncovered any plot. A resignation would thrust Lebanon back into the arena of regional rivalry between Sunni Muslim Saudi Arabia, an ally of Hariri, and Shi‘ite Muslim Iran, which backs Hezbollah. President Michel Aoun, a political ally of Hezbollah, will wait to accept or reject Hariri’s resignation until he returns to Lebanon to explain his reasons, sources at the presidential palace said. Central Bank Governor Riad Salameh sought to calm fears the political turmoil unleashed by Hariri’s bid to resign would hit Lebanon’s already fragile economy, issuing a statement to reaffirm the stability of its currency, which is pegged against the US dollar. In Lebanon’s sectarian system the president must be a Maronite Catholic, the prime minister a Sunni and the speaker of parliament a Shi‘ite. Hariri is Lebanon’s most influential Sunni politician. His father, Rafik al-Hariri, was prime minister after Lebanon’s 1975-1990 civil war and was assassinated in a car bombing in 2005. A UN-backed tribunal has indicted five Hezbollah members for the killing but the group denies any involvement. Saudi media have published reports of a plot to assassinate Hariri in recent days, but all of Lebanon’s main security branches have said they have no information about such a plot.